This is an easy and tasty crockpot black-eyed pea dish for New Year's Day or any everyday family dinner. Black-eyed peas are a Southern tradition for New Year's Day. There are multiple theories about how this tradition began, a couple of them relating to the Civil War. 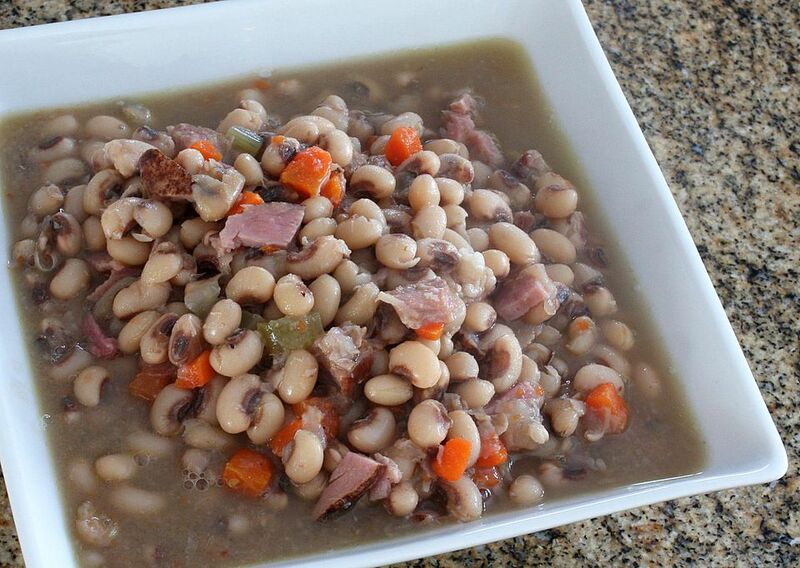 But whatever the source, if you grew up in the South, you likely were served black-eyed peas for New Year's Day. The symbolism that gets passed along is that the black-eyed peas swell, which is a sign of growing prosperity in the new year. Black-eyed peas are not peas; they are a bean that is a subspecies of the cowpea. Heirloom varieties of black-eyed peas grow throughout the South. Some of them have eyes that are other colors, such as brown, red, pink, or green. The black-eyed peas are green when they are first shelled; then they fade to buff as they are dried. This recipe uses frozen black-eyed peas. You can also find fresh black-eyed peas and dried black-eyed peas. Either would work, but it would be wise to soak the dried peas overnight before adding them to the crockpot. Slice the celery and green onions, mince the garlic, and dice the ham. Serve in a bowl along with some of the cooking liquid. For a traditional Southern New Year's Day meal, serve the black-eyed peas with collard greens, cornbread, and a pork chop. You can use other meat than ham to flavor the black-eyed peas. Salt pork, bacon, or pork sausage could substitute for the ham.